Helping someone in their time of need is a thoughtful and inspiring occupation. It is with this passion and determination that we created a special collection of Nurse Gift Ideas that look great in the ward, office or at home. Outfit the entire medical office in cute & fun Nurse Gift Ideas that are functional and of course look great. 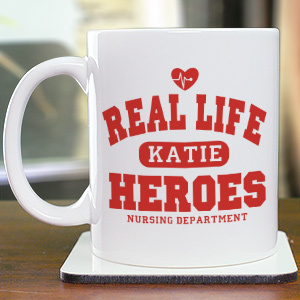 All of our Nurse Gift Ideas make great Nurse Appreciation Gifts for all of the hard work they do every day. Being a nurse is a profession which takes great caring, patience & kindness. Remember your favorite nurse with one of these Personalized Wood Picture Frame which they can display their favorite photograph in. Engraved Nursing Personalized Wooden Picture Frames also make a perfect Graduation Gift from Nursing School. Give your favorite nurse the best appreciation gift that truly comes from the heart. This teddy bear features an irresistible look on his face along with a wonderfully soft feel. He has contrasting tan fur on the inside of his ears and his snout. Surface washable and safe for all ages. Choose between three great sizes ranging from 11" to 21"! Free personalization of any name is included. We apologize, at this time we do not offer a gift box large enough to hold our 17" or our 21" Sherman Teddy Bear. A simple, useful personalized gift says a lot. Your favorite Nurse will love this Personalized Nurse Key Chain and you will love the price. Includes FREE Personalization! 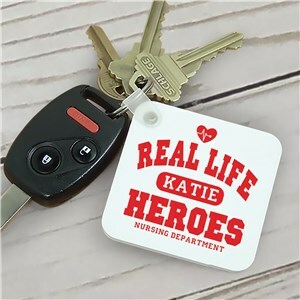 Personalize your Real Life Heroes - Nurse Keychain with any name. 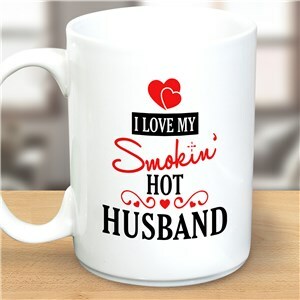 Let your significant other know how hot you think they are with our Personalized Smokin' Hot Coffee Mug. We will personalize this coffee mug for you with any title of your choosing. Makes a great gift for your smokin' hot better half! Present your favorite doctor with a personalized doctor gift that is sure to be used every day. 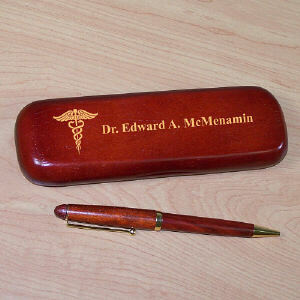 A Personalized Doctor Writing Set is an inexpensive doctor gift with an expensive feel. Each Rosewood Personalized Doctor Pen Set makes a unique Doctor gift for him or her. Personalized Pen Set for any doctor is presented with a matching rosewood case for convenient storage and a beautiful gift presentation. Pen measures 6" in length, black ink and features twist action ballpoint operation. The pen can be refilled with a standard Parker refill. The Doctor Pen Case is personalized with any name. Show your favorite doctor how thankful you are by giving Engraved Medical Christmas Ornaments. Each Engraved Medical Keepsake is professionally engraved for optimal presentation and looks wonderful hanging from a Christmas tree or used as a stunning sun catcher hanging on a window. 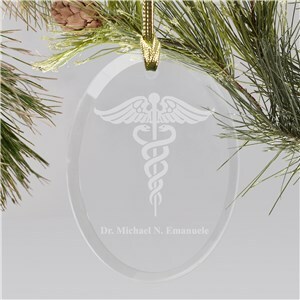 This glass engraved ornament is laser etched with the Caduceus symbol and any persons name. A warm mug of coffee and good conversation is the perfect way to enjoy a break. 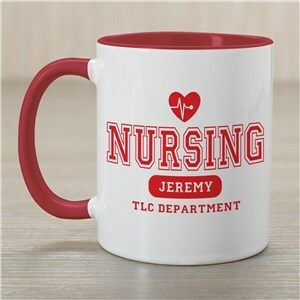 Give Nursing Customizable Coffee Mugs to your favorite Nurse or the entire ward as thoughtful Nursing Appreciation Gifts for a job well done. Our Personalized Mugs are Dishwasher safe & include FREE Personalization! Personalize your Nurse Coffee Mug with any first name. Mugs are available in different sizes ranging from 11 ounces to 20 ounces. Proudly display your medical profession with our Personalized Doctor Business Card Holder. A handsome, personalized gift which presents a strong and knowledgeable display of your current business card. A great personalized gift for a new doctor or your favorite doctor. 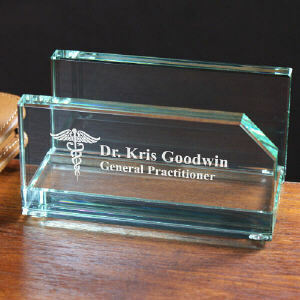 Your Engraved Medical Professional Business Card Holder measures 2" x 4" x 2 1/4". Includes FREE Personalization. Personalize your Business Card Holder with any two line custom message. There are no words that can express your true feelings of thanks & gratitude for the steady & professional care one receives from a nurse. 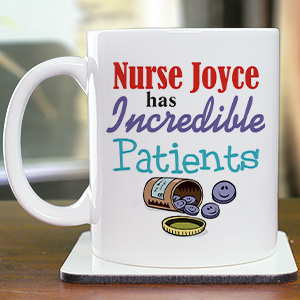 Honor your favorite Nurse with Nurse Customizable Coffee Mugs as a small memento of appreciation for the hard work helping you recover. Our Personalized Mugs are Dishwasher safe and hold 11 oz. Includes FREE Personalization! Personalize your Nurse Coffee Mug with any first name. Give our Tower of Sweets as a gift and score big points with family and friends. Stacked with ten different kinds of delectable treats to enjoy (and share if you're feeling generous). 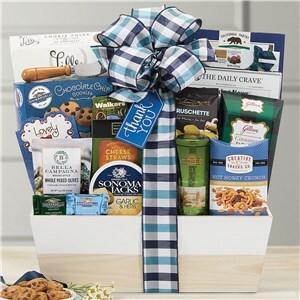 Great gift for any occasion, and so easy to order online! 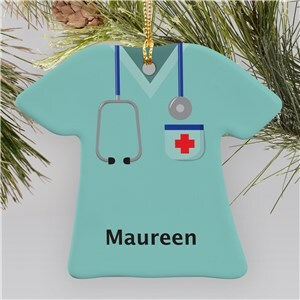 Show the special nurse in your life how much you appreciate them by presenting them with Personalized Nurse Ornaments. They'll love that every year during the holidays you show your appreciation for all that they do for you. This is a flat ceramic ornament that measures 3"H x 3.5"W. Each includes a ribbon loop so they can be easily hung from a tree or stand. Free personalization of any name is included. The nurse in your life is so passionate about her profession. Make sure she knows how much you appreciate her willingness to go above and beyond for her patients. Being a Nurse is more than just a job, it is a way of life. Caring and nurturing people back to health is a honorable profession which deserves great praise. Create a lovely Personalized Nurse Picture Frame for your favorite Nurse as a Personalized Keepsake. Your Personalized Nurse Picture Frame is sure to look great in the office or at home. Each Personalized Frame has a timeless look and provides ample room to display your favorite photograph. An Unique Personalized Gift for Mother's Day, Father's Day, Birthday or as a Nursing School Graduation Gift. Graduation picture frames are a great way to display your pride for all to see! Our Personalized Registered Nurse Picture Frame comes in three sizes, please choose from, 4"x6, 5"x7" and 8"x10". Nurse picture frames include an easel back that allows for desk display or can be hung on the wall. Includes FREE personalization! 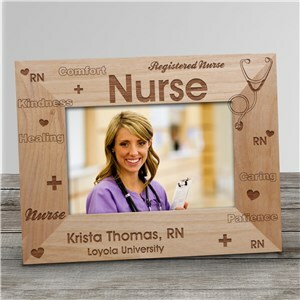 Personalize your Nurse Picture Frame with any occupation, name and title. 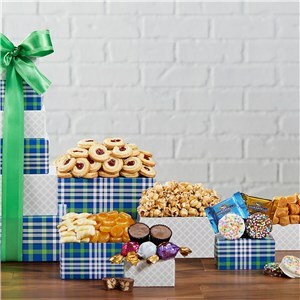 GiftsForYouNow.com is the leader in Personalized Nurse Gift Ideas for every occasion. We have perfect gift ideas for a graduating nurse to a nurse officially retiring from years of wonderful service. All of our unique gift ideas for nurses include FREE Personalization.